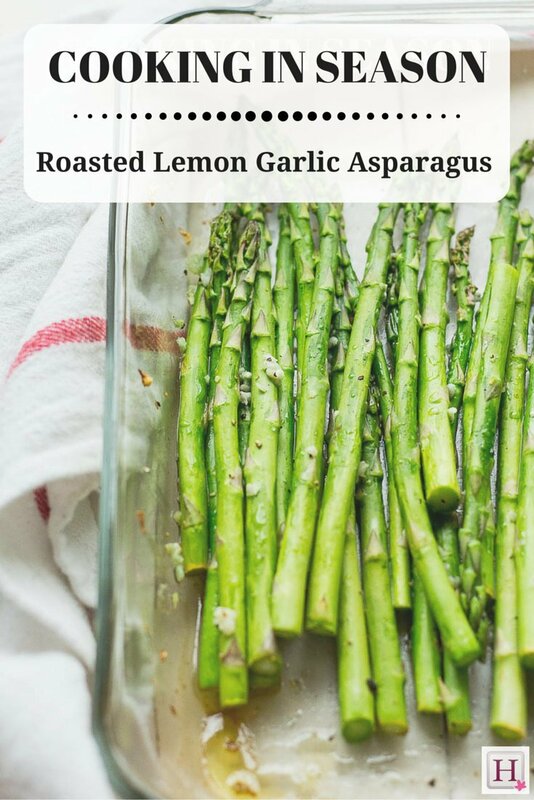 Plus a delicious and easy recipe for roasted lemon garlic asparagus. Asparagus is a nutritionally-dense vegetable that can help ward off heart disease, type 2 diabetes and cancer. It's filled with antioxidants and vitamins E, K, and C, as well as potassium, which helps to lower blood pressure. Asparagus is a spring vegetable that has a short season: it is more readily available in grocery stores from February to June, and is at its peak from mid March to May, when it is harvested in Ontario and is at its lowest price. Though asparagus has traditionally been served as an appetizer or as a side dish, it has become quite cosmopolitan and trendy over the years, making appearances in everything from savoury tarts to stir-fries. You may be familiar with the green vegetable that we call asparagus here in Canada and the U.S., but in many areas of Europe only white asparagus is available, and it is more tender than its green counterpart. Fresh asparagus is a beautiful vibrant green colour that has no signs of shrivelling or wilting. The tips of asparagus, also known as spears, should be either a darker green than the stalks or have a purplish tinge. These are also the first parts of the vegetable to go bad, so mare sure they are firm and not squishy or gooey. The stalks (the cut end) will be thick and fibrous — the plant's reaction to the injury of cutting. This end is cut off before cooking, but if the shoots are fresh, you may lose only an inch. Avoid getting home from the grocery store and just dumping your bunch of asparagus in the produce bin of your refrigerator where it could become broken, bruised or forgotten. Asparagus should be kept in the fridge with the stalks immersed in water, just like the way they are kept in the store. If you're the right mix of careful and lucky, your asparagus will last up to seven days in the fridge. To ensure optimal freshness, plan to use up the bunch within five days. Asparagus can be boiled, stir fried, roasted, barbecued or even eaten raw and julienned in spring salads. It can be used in the most unexpected ways, such as in soups, as a topping on pizza or as a delicious addition to Sunday brunch. Because it is so versatile and pairs well with any kind of protein, it’s a popular option for spring and summer recipes alike. Cut one inch off the bottoms of each stalk of asparagus. Toss in olive oil, lemon juice, garlic, salt and pepper. Place in an oven-safe dish. Once oven is preheated, roast on the middle oven rack for about 12 to 15 minutes, or until asparagus is tender and ready to eat. Careful not to overcook! Enjoy as a side to chicken, steak or fish.